Last year Big M broke my heart when he asked me not to leave love notes in his lunch box anymore. It’s embarrassing and I totally get it. He’s getting older but I still want to put something special in his lunch, something that lets him know I’m thinking about him. Part of what makes parenting fun is figuring out how to connect with our kids. So I got creative and added lunch box jokes instead. They’re fun for all the kids at the lunch table, they let him know that I’m thinking about him and they aren’t the least bit embarrassing. Since I’ve already compiled the list… I thought I’d share it with you! Read through them and then print them out. Sometimes I write the jokes on the back of a Capri Sun pouch, sometimes on a napkin and sometimes I use the printout! What is a pirate’s favorite letter? —- Rrrrrrrr! What do you call a flying skunk? —- A smelly – copter! Where do sheep go to get their hair cut? —- The baa – baa shop. What do you call an alligator in a vest? —- An investogator. What did the buffalo say when his son left to go to school? —- Bison. Why did the cow cross the road? —- Because he wanted to go to the moooovies. Why did the cookie go to the doctor? —- Because he was feeling crumby. What did one plate say to the other plate? —- Lunch is on me. What type of socks do pirates wear? —- Arrrrrrrrgyle. Why was 10 scared? —- Because 7 ate 9. How do you make a tissue dance? —- Put a little boogie in it. What do you call a train that sneezes? —- Achoo choo train. Why did the golfer pack an extra pair of pants? —- In case he got a hole in one. What did one eye say to the other eye? —- Something smells between us. What stays hot in the fridge? —- A hot dog! What is a rabbit’s favorite kind of music? —- Hip Hop. What do you call a sleeping T-Rex? —- A dinosnore! What did one pencil say to the other pencil? —- Man, you’re looking sharp! 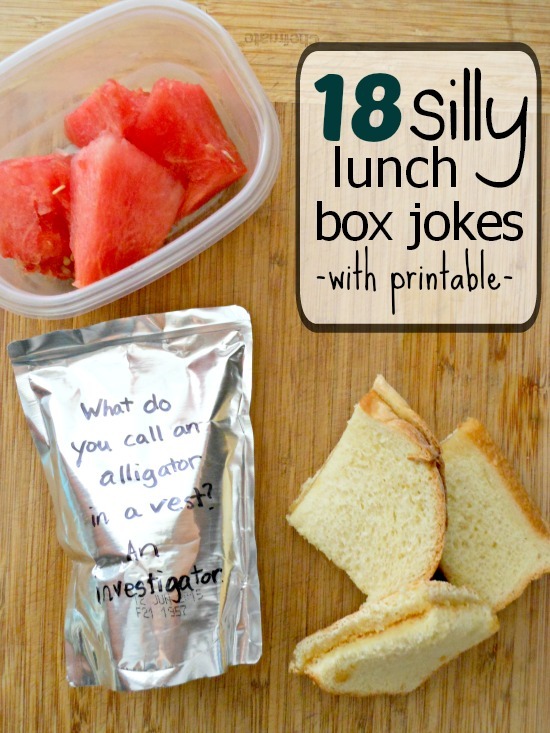 Share your favorite lunch box jokes for kids in the comments! I’m an elementary school secretary and oversee the morning announcements. I like the pencil jokes. Looking for more jokes to give students a chuckle on the mornings of those hideous standardized tests. That’s great Susan! What a fun way to start the school day. I am a teacher and used your Summer Jokes for Kids for a fun assignment at the end of the school year for my reading intervention group. Each child chose a joke they illustrated on the front-side of a piece of construction paper. The back of the construction paper had the punch line of the joke written on it. We mounted the jokes on a paint-stir stick and then practiced them for reading fluency. When we were proficient with the jokes, we shared them with a couple of other classes. Then we passed out copies of the jokes to share with the kids in the class. It was a successful project. When kids are bored this summer, let them create their own joke book from some of the jokes on the site! I put jokes into my kids lunch boxes also. It is a nice way of getting them to think of you when they are at school and I know they love it. I am always looking for extra jokes or silly sayings. Nice to know others do too. Q:What is a pirates favorite letter? A:Arrr? No, it’s the sea!! Why isn’t a nose 12 inches long? I C U U 2Y’s 4 Me! Sorry joke got messed up. I C U R 2Y’s 4 Me! What did the Daddy tomato say to the baby tomato on their walk? Catch up! Keep the fun rolling with these 18 silly lunch box jokes.